Once a student has reached junior year, deciding on and preparing for the college entrance exams is critical. It is the fastest way to improve or bring down a college application. Students who have less than stellar grades will improve their chances of being admitted to colleges considerably with impressive test scores. Similarly, students who have impeccable academic records can drastically decrease their chances of getting into their dream schools if they perform poorly on standardized tests. In short, a lot is riding on these tests. There are several ways to prepare for these types of tests including independent practice, ACT test prep classes and private tutoring. We have found at Chicago Academic that private tutoring yields the best results because it is completely customized for the individual student. The decision of which exam to take, the SAT or ACT, may be determined simply by the admission criteria of the schools to which the student is applying. Generally, both exams are ubiquitously accepted in the United States. Although there is no hard science that proves that the ACT or SAT is easier, the student probably wants to determine which test format best suits their strengths. Each test has different emphases and familiarity with their individual structures may help sort out which is better suited for the student. The ACT sports four multiple-choice subject tests covering English, Math, Reading Comprehension, and Science Reasoning. These are designed to evaluate overall educational development and ability to complete college-level work. As far as scoring goes, subject test scores (ranging from 1 to 36) are determined after throwing out any incorrect answers. There is no penalty for guessing on the ACT. The four areas are then averaged together to come up with the overall, or composite, score. The ACT also includes an optional 30-minute writing test designed to measure skills in planning and writing a short essay. This segment provides a chance to show the students writing skills! If the student opts to take it, the additional scores will be reported. These scores are reported separately. So, if writing is a weak area, the student may want to take the ACT and skip the writing section, since it’s currently optional (although some schools require it). When looking at the SAT in comparison to the ACT, a clear difference is that the SAT is designed to evaluate general thinking and problem- solving abilities. It starts with a required 25-minute essay. This is the start to the Writing section, which is completed in addition to the Critical Reading and Math sections. The SAT differs from the ACT in terms of the amount of time given to complete it (3 hours and 5 minutes) and the format used to provide answers. Similar to the ACT, the SAT has multiple-choice areas, but it also has a part in the Math section where students are required to produce their answers. And unlike the ACT, the SAT does penalize for wrong answers on the multiple-choice questions (but not on the student-produced ones). When considering the ACT vs. the SAT, keep in mind that both tests allot ample time for completion, but the SAT has fewer questions — 140 compared to the 215 on the ACT. The SAT also focuses heavily on vocabulary, while the ACT hones in on grammar and punctuation. At Chicago Academic, parents are always asking us which test their child should prepare for, the ACT or SAT. We understand that every student is different, with their own academic stregnths and weaknesses. Given similar Explore and PSAT test scores, or some other preliminary score on either exam, our opinion is that the ACT is an easier exam to prepare for. First, the level of vocabulary required is not as severe as the SAT. Most importantly is the predictability of the ACT experience. The ACT sections are always the same legnth, with the same sections in the same order. 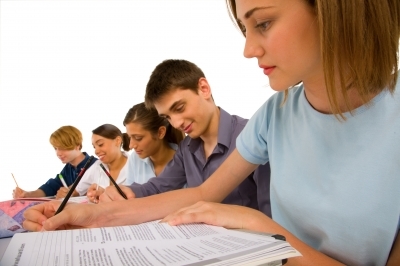 This allows for a highly effective personal test taking strategy to be developed. Chicago Academic helps each student design a personalized strategy, including time management, for each section of the exam, based on its predictability. We believe given all factors being equal, students time would be better utilized preparing for the ACT, whether it be on their own, in a class or with a private test prep tutor. Are you interested in improving your SAT and ACT scores? Chicago Academic can help! Click here to contact us today.